Artist Jeff Lieberman captures the beauty of an elegant slow dance in this optical illusion art. Hands extend. Partners embrace. Feet glide gracefully across the floor. An enchanting exchange, the slow dance is mesmerizing and mysterious. Searching for a way to capture this beauty, while creating a symbolic gift, Jeff Lieberman designed this mechanical art piece. Conceived as a wedding gift for dear friends, who are both dancers, Jeff's innovative design combines science, technology, and art to make everyday objects appear to move in slow motion. 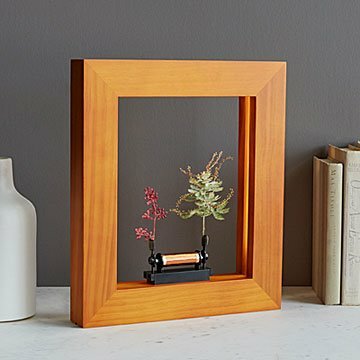 It's an optical illusion, created by synching lights to vibrations, but the scene is remarkably alluring: flowers, leaves, and other tiny treasures elegantly undulating within a shadow-box-style frame. Whether the piece is hung on the wall or positioned on a table or shelf, the objects can move freely through three different dance modes. Follow Jeff's lead and give it to a couple to represent the lifelong dance they're about to embark upon together, or hang one in your own home as a reminder to take a moment to slow down every now and then. Handmade in China. Jeff Lieberman explores the connections between the arts, sciences, education, creativity, and consciousness through his art. Based in Cambridge, Massachusetts, he shows his technological sculptures around the world with the goal of helping people create an emotional and mystical connection with science and the universe. Jeff completed four degrees at MIT (physics, math, mechanical engineering, media arts and sciences), where he worked at the MIT Media Lab before launching his own design firm. He also hosted Time Warp on the Discovery Channel, a series that examined the use of technology to see beyond the limits of our normal human perception. copper wire, Pine wood with Polyurethane Polycarbonate, Spring steel, Polyurethane Rubber feet, & Silicon tubing. This device utilizes high speed strobe lights in order to create the visual illusion of slow motion. If you have sensitivity to strobe lights, or a history of photosensitive epilepsy, please check with a doctor before using Slow Dance. Thought went into every inch of this perfectly crafted, customizable, adaptable, piece of technological art, that exploits our own brain to mesmerize us. Try different items and see how they look, play with the different settings with your friends or kids, leave it on during a dinner party, or pass by and be reminded of how what we see is not always what is real.